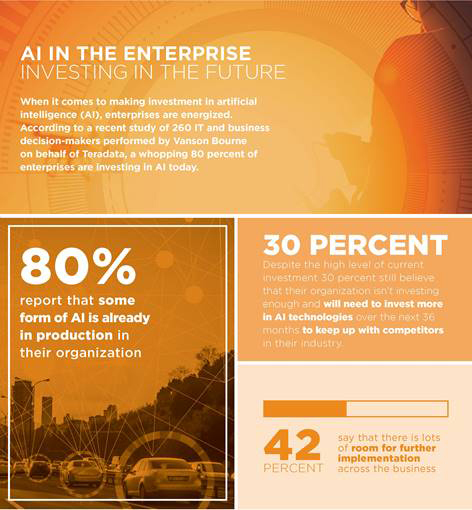 A whopping 80 percent of enterprises are investing today in AI, but one in three business leaders believe their company will need to invest more over the next 36 months to keep pace with competitors. 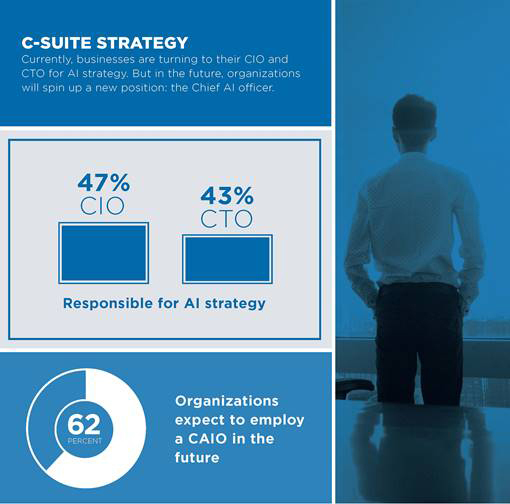 At the same time, enterprises are anticipating significant barriers to adoption and are looking to strategize against those issues by creating a new C-suite position, the Chief AI Officer (CAIO) to streamline and coordinate AI adoption. These results come from survey of 260 large organizations that operate globally, conducted by leading technology industry market research firm Vanson Bourne on behalf of Teradata (NYSE: TDC), the leading data and analytics company. 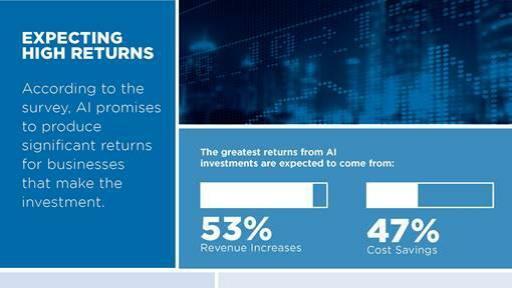 The survey results found that companies are bullish and expect their AI investments to be worth the upfront cost. The industries where respondents expect to see the most impact from AI are IT, technology and telecoms (59 percent); business and professional services (43 percent); and customer services and financial services were tied for third (32 percent). The top three challenges where businesses expect AI to drive revenue are product innovation/research and development (50 percent); customer service (46 percent); and supply chain and operations (42 percent). This mirrored some of the top areas of AI investment, which include customer experience (62 percent), product innovation (59 percent) and operational excellence (55 percent). 80 percent of respondents report that some form of AI is already in production in their organization, although 42 percent say that there is lots of room for further implementation across the business. 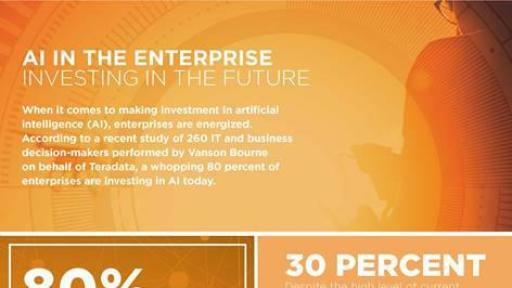 30 percent still believe that their organization isn’t investing enough and will need to invest more in AI technologies over the next 36 months to keep up with competitors in their industry. Almost all respondents are anticipating barriers to adoption and ROI — as is the case with nearly every emerging technology. 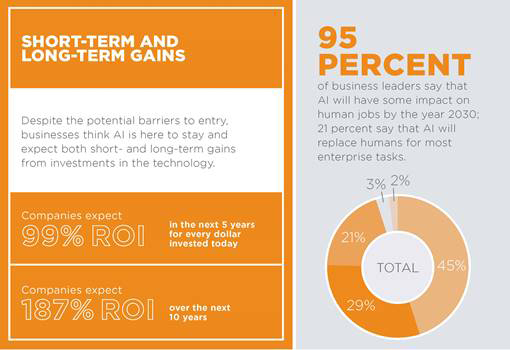 Businesses are ready to continue to invest in AI, likely because of the gains executives and IT decision-makers anticipate in cost and time savings, but lack of IT infrastructure and lack of access to talent are cited as the leading barriers. Surprisingly, business leaders are not as concerned about the impact AI and automation will have on employee morale — only 20 percent see this as a barrier — and even less, 19 percent, are worried about making a business case for AI. 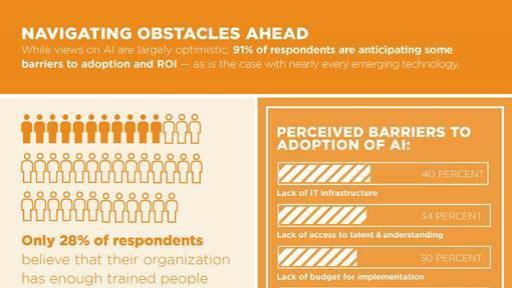 91 percent expect to see barriers to AI realization, with lack of IT infrastructure (40 percent) and lack of access to talent (34 percent) leading the challenges, followed by lack of budget for implementation (30 percent), complications around policies, regulations and rights (28 percent) and impact on customer expectations (23 percent). By contrast only 19 percent view a weak business case for AI technologies as a concern and only 20 percent are concerned about the impact of AI and automation on employee morale. 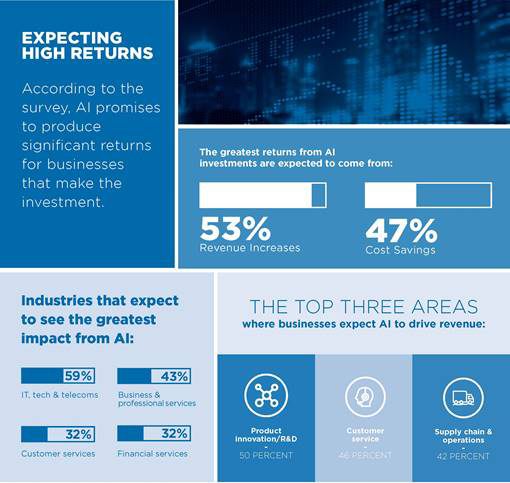 Businesses anticipate about a half-and-half split between revenue increases (53 percent) and cost/efficiency savings (47 percent) from their AI investments. Only 28 percent of respondents say that their organization has enough trained people internally to buy, build and deploy AI. 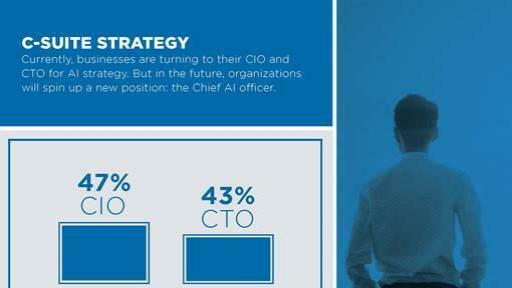 While executives currently rely on existing technology leaders like CIOs and CTOs to steer AI adoption and strategy, they believe the future of AI will be so relevant for creating a strategy across business practices that they will need a CAIO (Chief AI Officer) to coordinate and mandate implementation throughout the enterprise. The CIO (47 percent) and CTO (43 percent) are leading the effort today, but 62 percent of respondents say they are planning to hire a dedicated role — a CAIO — to lead the effort in the future. Companies expect a 99% ROI in the next five years for every dollar invested today and 187% in ROI over the next 10 years. The industries that most anticipate positive impacts are: IT, technology and telecoms (59 percent); business and professional services (43 percent); consumer services (32 percent); financial services (32 percent); and manufacturing and production (31 percent). Tech companies have been promising AI as a robust solution and business strategy for the past few years, and this survey shows businesses are realizing the benefits of AI adoption today. Enterprises expect AI to be a technology with longevity, planning to double their investment in five years and triple it within 10 years. But to maximize this ROI, companies realize they must re-imagine how AI will disrupt all aspects of their businesses and create a suitably agile strategy to gain ROI.